This entry was posted in Disks, Windows and tagged SCSI ID, Virtual Disk, VMWare by admin. Bookmark the permalink. This isn’t always true. 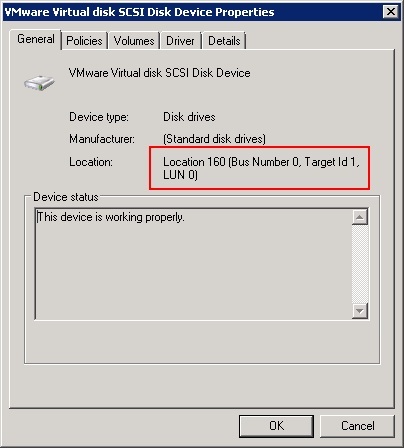 If you have a disk on SCSI 1:0 for instance it might not show up properly using your matching method…IE in my case vmware disk SCSI 1:0 shows in windows as Bus 0, Target ID 0, Lun 0. It’s best to compare the “Location” with the scsi port slot number in the vmx file for the disk. What´s a confusing and really bad article – it is not true!!! Bus nr is definitelly not always SCSI nr.